Coolermaster is one of the most famous manufacturers of gaming components; today we will tell you about our experience building a gaming PC only with Coolermaster components. Some manufacturers are capable of giving us everything we need in order to build a computer. Coolermaster is a perfect example: they have PSUs, cases, cooling systems and even hardware such as mice, pads and keyboards. Today, we used some of the latest Coolermaster components to build a gaming computer every gamer would feel proud of owning. This is one of the latest Coolermaster components. It can be described as a smaller version of the Coolermaster Cosmos, with some of the features that made it great. Design-wise, the Cosmos II is very similar to Coolermaster’s first Cosmos, which became the company’s trademark. This case is capable of housing any component and the latest cooling systems, as well as big-sized graphics cards. Its design makes it possible to hide the cables, configure the position of the bays to suit your needs and use any cooling system you want. You can install up to three simultaneous 120-mm lateral radiators, and 280-mm ones on the upper part as well as 360-mm frontal ones. It also has two 3.5, two 5.25 and two 2.5.inch bays, as well as enough room for any GPU. It costs around 299 dollars, an excellent price considering its characteristics. It includes four fans, a 120-mm one in the rear, a 140-mm one on the upper part and two frontal ones with blue-colored LEDs –which you can control, turn on and off with the two frontal buttons on the case-. It also has two frontal USB 3.0 ports and two USB 2.0 ones, anti-dust filters. A version with an acrylic-made lateral panel is also available. I believe gaming rigs must adapt to the task at hand. While it’s true that we tend to use the latest components, in this “Coolermaster Gaming Rig” we’ve opted for a more modest –but still high-quality- semi-modular power supply unit. Coolermaster’s V series are designed with a single 12v rail, which means every connector has always the same power and you can forget about overdoing it with one rail. This 550w models offers a power of 45 amperes at 12 watts with a normal efficiency of 92%. This means this is an 80 Plus Gold power supply unit, compatible with the latest Intel Haswell processors. The 120mm fan always keeps below 2000rpm, and the noise is kept around 30dBA. Its semi-modular 150mm design make this power supply unit perfect for any case, allowing you to have your components perfectly organized. This power supply unit is designed for a single mid to high-end graphics card that uses up to two 6 or 8-pin PEG connectors. This is more than enough for a PC that combines SSD and mechanical storage devices and a mid-level graphics cards. Most cables are 550mm long, so you can even use them in bigger cases like the Cosmos SE. This power supply unit costs approximately 54 dollars. Efficient design with PCB connectors to ensure the best possible quality at all times. Pre-mounted liquid cooling systems are more popular each day, since they make users avoid most of the hassle that comes with installing one on their own. We think they’re very nice alternatives, not only because they’re efficient and user-friendly, but also because they tend to be very good-looking. Also, thanks to their design, they almost never need maintenance. 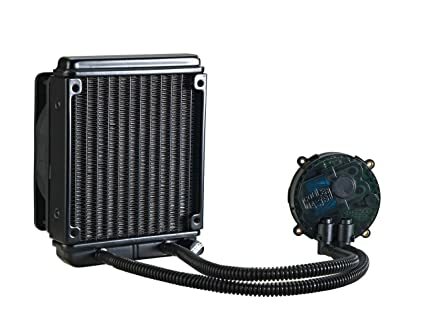 Coolermaster’s Seidon 120m is one of the most affordable (71 dollars) and features a 120-mm radiator with a PWM fan with speeds that range between 600 and 2400rpm and noise between 19 and 40dBA. It also features an integrated pump; it’s designed to adapt to any processor, from the latest to some older ones, so you can use it in pretty much any computer and every processor out there. The pump has a 70000-hour service life. Small and effective: The Seidor 120m is very easy to use and offers top-notch results. The dissipation block features a copper-made heat exchange surface to take full advantage of the water flow. 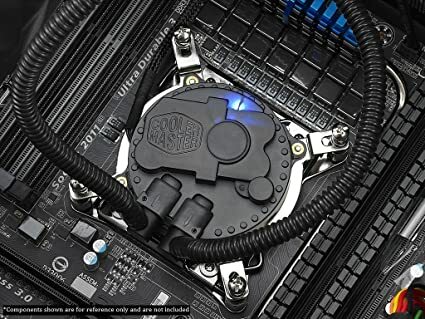 The radiator is aluminum-made, and the block is made from copper, so if Coolermaster didn’t use the correct liquid, this can translate into galvanic corrosion. It’s time to add the high-end components Coolermaster has for us. We opted for an Ivybridge processor, Z77 motherboard and 16GB of DDR3 RAM. We also added a Revodrive from OCZ, which can now be found for less than 150 dollars, and an old but still powerful graphics card, the Radeon 7950, which is faster than even the Radeon 270X and therefore capable of displaying games at 1080p resolutions even in monitors with high vertical refresh rates. IT’s perfect for games like Battlefield 4 or the most recent and upcoming games. Processors like the 3770k we used can also be found for cheap, and along with a Z77 motherboard, we can have a very powerful PC to enjoy the latest games. We also have various over clocking options and the usual high-end features like USB 3.0 connectivity, SATA 6gbps and more. With a little bit of more RAM, which is a little on the expensive side as of now, we can have the perfect rig. The approximate price of our rig is about 900 dollars without extra accessories or components. Good hardware always means good results. Coolermaster’s components are top-notch and the cooling system, which we expected to be a major hassle to install, was very easy to use and offered a great performance with the Ivybride 3770k working at 4.4GHz. No noise and no issues. The power supply unit performs just like we expected it, and its design make it easy to always have our cables well organized, something essential for any computer; the semi-modular design of this power supply unit as well as the excellent design of the case do help to achieve this. The Cosmos SE is much smaller than the conventional model, but it’s pretty much the same design-wise. It’s impeccably made and follows the latest trends in regards to gaming computers, like mounting big radiators in different positions. Although the components we used aren’t that complex, which means this case is definitely capable of much more. If you’re willing to spend a bit more, you’ll have an absolutely powerful gaming computer that will last for a while.